1.) 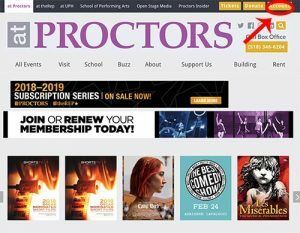 Visit https://www.proctors.org/. Click on “Account” on the tab in the upper right-hand corner. Read: How to Create an Account. 2.) After logging in, click on Subscriptions in the top menu bar. 3.) 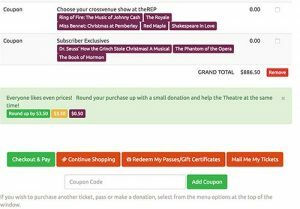 Click on New Subscription for either theREP or Proctors. 4.) Next, you will need to select your favorite seats. Select the performance day that works best for you. Select the seats that you would like. Please review your ticket exchange benefits to change seats after selection. Then click Suggest Some Subscription Seats. This may take a few moments. 5.) The next page will allow you to see where the seats are. You can either Add Subscription to Shopping Cart or Suggest Other Seats. This may take a few moments. 6.) 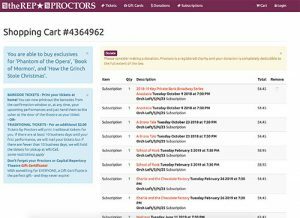 If you are purchasing Proctors subscriptions, you must select one theREP show per subscription. 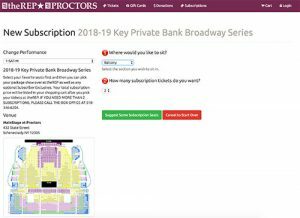 If you are purchasing a subscription for theREP, you must select tickets for your one show at Proctors per subscription. These options can be found at the bottom of the subscription review page, which will guide you through ticket selection. 7.) You can add optional subscriber exclusives as indicated at the bottom of your subscription shopping cart. You can always add these later as well by logging into your online account. 8.) Click Checkout & Pay. 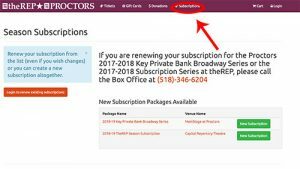 Subscribe online or call our Box Office at (518) 346-6204 and choose the subscription line option when prompted.